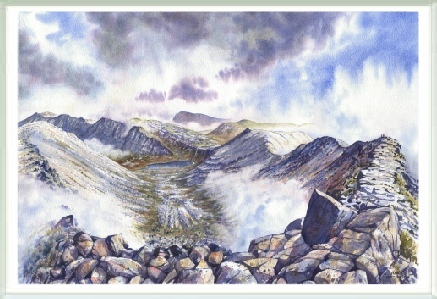 From below, Arkle has the appearance of a flattened dome with extensive skirts of scree. At the top there is a surprise - Arkle is hollow! The ex- pected stony plateau is limited to the south-eastern end of the mountain; the rest is bitten away by the huge corrie of Am Bathaich, leaving a delectable curving quartzite ridge to lead the walker to the true summit further north. The view is expansive, from surf crashing on the shores of Sandwood Bay in the west to the distant Orkneys in the north-east. Closer to hand rise the sharp ridges of Foinaven, the rounded grassy domes of Meall Horn, and the huge whaleback of Ben Hope. In 5 days camping here I saw no other person. The “crowds” all rush to Ben Hope because at just over 3000ft it is a Munro - yet Arkle, Foinaven and Ben Loyal all have more to offer. We tend to judge mountains by height, as we tend to judge people by material success, and thus we miss the real jewels in both cases.